Editor's note: 60 Minutes is slated to rebroadcast the segment detailed below Sunday, July 15, at 7 p.m. as part of its summer edition. 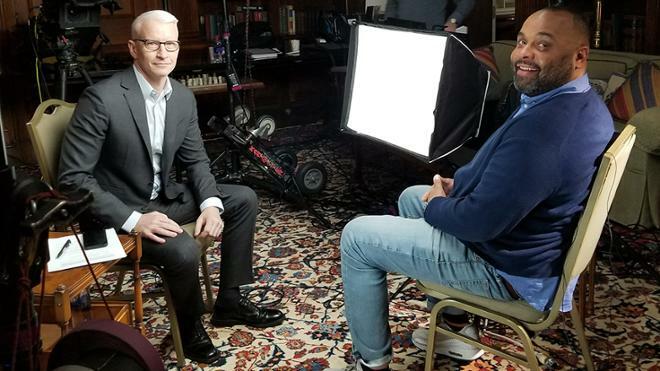 Sought after for his expertise in U.S. history and civil rights, University of Richmond leadership studies professor and historian Julian Hayter discusses the national debate about Confederate monuments with Anderson Cooper on this week’s “60 Minutes,” which airs Sunday, March 11, at 7 p.m. on the CBS Television Network. A CBS News release notes that through interviews with a variety of experts, including Hayter, Cooper will examine the question many people are asking about the hundreds of Confederate monuments standing on public property across the country, mostly in the South. Some believe these monuments should be taken down because of the painful memories they represent while others, like Hayter, believe the monuments are a part of our shared history and should stay. “No state has more Confederate monuments than Virginia, where in the Confederacy’s old capital, Richmond, there are five Confederate statues standing on the city’s historic Monument Avenue,” a preview of the segment states. Cooper visited both the University of Richmond campus and Monument Avenue to discuss this hotly debated issue with Hayter. Hayter was appointed to Richmond Mayor Levar Stoney’s Monument Avenue Commission due to his expertise in U.S. history and civil rights. Stoney also appears in the segment. Sought after for his expertise in U.S. history and civil rights, Hayter discusses the national debate about Confederate monuments with Anderson Cooper.